Slave amp was set with gains all the way down. Price is shipped but you pay paypal fee. Shipping will be usps priority with standard insurance unless paid for extra. Comes with GP dual 2/0-1/0 inputs. More pictures upon request, they are still mounted in my car so I can show video/picture proof that everything is working and legit.! Thermostat, ags delete, colder plugs, K&n drop in. A pic with date and user name, to prove that they are in you possession, glws. Is that even legal?....to make the buyer pay paypal fees? I guess you aren't on any other forums that aren't car audio related? That is a pretty common practice on a lot of the forums I have frequented in the past although I never saw the purpose in it. Just ask for $360.76 if you want 350 dollars to show up in your paypal. One amp is pending local sale. Will be letting go of the slave amp... the one with less color fade, If anyone is wondering. Doesn't matter what other forums do. They have their own set of rules...as does this forum. I just dug up some Paypal info and it states that it's the sellers responsibility for the paypal fees. tookoff is just being cheap about it and getting away with it if he can. Now if both parties come to an agreement to settle the score then so be it. [quote name='Boomin_tahoe']Doesn't matter what other forums do. They have their own set of rules...as does this forum. I just dug up some Paypal info and it states that it's the sellers responsibility for the paypal fees. tookoff is just being cheap about it and getting away with it if he can. Now if both parties come to an agreement to settle the score then so be it. You came to my forsale thread without any intentions on buying my equipments to ***** about me not wanting a odd number in my bank account. If you don’t like it report my post and keep it moving. This is why this forum has died because of people like you. Get a life, have a great day. Thank you bud, I buy and sell on multiple forums and this is the first I’ve ever had any issues about it. The amps are very efficient and powerful. I’ll be sad to let them go. One is pending pickup now. I know i know from the dead. Still available? WTB Beasty amp!! 2,500-4,000 RMS @ 1 Ω Have Lesser powered amp to add! Like the title says i am in desperate need of an amplifier to power my 3 - 15's that are 1500 watts rms each. I dont want to push these that far to constant RMS daily but need the closer to that than what they're currently geting fed. The amp that i have to trade is THIS ONE!! I also have a custom box for 3 - 15's that'll mount behind any extended cab truck. it's sealed. I,v got a Kenwood KDC-BT8044U head unit, a crossfire vr1000D amp, and two older kicker 12" cvr subs in a sealed box. 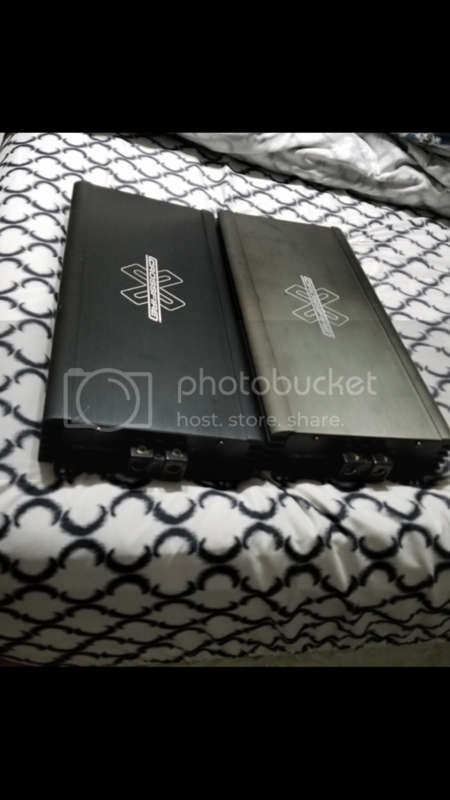 it forsher pounds in my corolla but it cuts out after a while...I also have a rocksford fosgate punch 4-channel amp hooked up to my speakers so idn if my batteries not supplying enough power or what. any suggestions? I am in need of some 6.5" or 6.75" comps. I've got a few things to trade with. WTTF: Need a 5 channel amp! Okay I'm in need of a 5 channel amp! My 4 channel is acting up and I've been wanting to downsize anyway. I have a few things I could trade. I have more pics of all the amps. I've got 2 old school Crossfire CFA series amps. Looking to trade for something! 2 or 4 channel amp? Head unit? 6.5'' comps? Subwoofer? Something?